He just gets so involved! I was taking pictures of Cassie, and I looked over at Michael watching TV. He gets very involved in what he is watching, and it made me laugh, too funny! I decided to get it on film... he didn't even know I was filming! Sorry... it's kind of dark and if you aren't sure what you should be looking for that's funny, it's the way Michael moves his head and mouth. In case you are wondering, this is how he plays video games too! And if your wondering... the pictures I took of Cassie will be posted later this week. 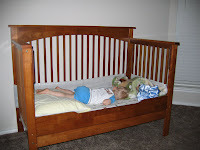 ...since we took the drop side off of Luke's crib. He's doing great! I took the side off in the morning and figured that I would try it out and see how he did for his nap. He figured out that he could climb in, but he didn't climb out, he waited for me to get him out. This picture is of his nap. It took him a couple of days before he figured out that he could get out on his own, so this is how I found him one night. We were going to move him back in bed before we went to bed, but before we could do that he ended up waking himself up by bonking his head on the bed every time he would try and turn his head and roll over. 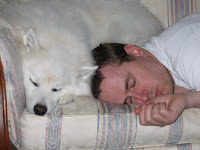 This is the only time (so far) that we have found him asleep on the floor. 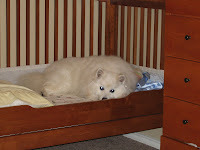 We ended up moving the crib to the front bedroom, (we had a bit of a scare one day) so there is just his bed, Ender's pet bed, and a basket of stuffed animals. He can't even get in the closet because we have those locked off. 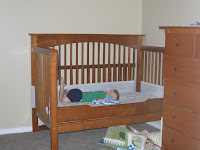 We had intended for the kids to share a room, but for now they won't share...besides when Cassie is transitioning to the crib from our room, and crying it out to sleep, we didn't want two crying kids trying to sleep. Luke still goes to bed at 6pm, but sometimes he won't go to sleep right away, sometimes we hear him at 7 or 7:30. But the plus side to that is now he will sleep until 7:30 or 8 am and play for a while. And he will finally take an afternoon nap at about 10:30 or 11:00 which works better than a morning nap at 9 and then nothing the rest of the day....those were long days! Ender likes the new bed too! 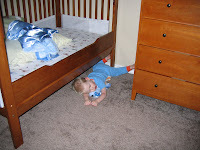 We weren't going to even try the bed for a while, Luke was doing really well still sleeping in a crib and he hadn't learned to climb out of it. But at least 2 or 3 times a week his legs were getting stuck in between the slats and it didn't seem to matter if he was a wake or asleep. Sometimes he would get so stuck he would bruise, and we were tired of going in and getting him unstuck. He now gets in and out of bed freely, but he always gets back in to sleep! I can't believe he's old enough to be in a big bed. What kid doesn't like bandaids? Mine! Luke got an owiee (however you spell that?) on his ankle from his shoes that are now too small...didn't we just get those? We have tried now twice to put a bandaid on it, the first so he wouldn't leave a little blood trail, and the second after a bath and the scab was all soft and came off. My first clue that he didn't like them was that I could barely get the thing on he was crying and moving so much. The second clue should have been that once the bandaid was on, he wouldn't put his foot to the ground at all. He eventually put his foot on the ground but would walk around on hid tip toes. Michael suggested we put a sock on his foot, so I did, and all was right again, it was like the bandaid was never there! I suppose it's only a matter of time until he does like bandaids or maybe he would like them if we had the kid bandaids. Short version: We are celebrating our 8 year anniversary! A lot has happened in the last 8 years, actually 8 1/2 years. January 14, 2001 is the day Michael and I met, and 6 months later we were married for eternity in the Seattle Temple. Since then we have experienced a lot of ups and downs in our own unique way! A job loss the day after we get back from our honeymoon, which eventually was the result of 7 addresses in the past 8 years (we have now lived at this address longer than any address). Michael finishing a crazy amount of school, his associates and a bachelor's in just 2 years. Moving far away so Michael could get a job, which meant that I had to quit my job of 6 1/2 years. Started building a house, but had to cancel because....Moving again to take better job. Got an awesome dog. Moved again. We were able to buy a house. Had unthinkable amounts of flooding in said house. Moved even further away in hopes of furthering Michael's career. Started another build job on a house before we moved but had to cancel that one as well. Ended up buying a house a few months after we settled in. And we have added 2 kids to the mix since living here. These are just a few of the things that top our list of ups and downs. There are many more, and even the things that should have been ups have turned into downs and what would have been downs have turned out to be not that bad, but not always. There has been many laughs, and just as many tears. There have been things that we would have done differently "if only we had known" and there have been things we wouldn't have changed anything. If you would have asked us if this is where we thought we would be the answer would be a no. But we are glad that we are here together to celebrate our 8 year anniversary! It hasn't always been easy, but I'm told it will be worth it! I texted Michael and asked him to bring me home a cherry limeade chiller on his way home from his softball game. Well, he brought me just a regular cherry limeade, but I thanked him anyhow and enjoyed my drink. So, I thought that he had just messed up the order, and he was confused at why I was dissapointed. He didn't see the text I had sent him until about an hour after he got home. We had a good laugh about what we thought each other had thought happened! It turns out that Michael was just being thoughtful and brought me a drink because he thought that I would like one, and the drink he ordered he thought I always ordered that, when really I never have even tried it! Happy Anniversary Michael, I love you! At some point in time I would like to start posting more than once a week again! But for this week, this is what you get! Enjoy! Pictures from the past couple of weeks. 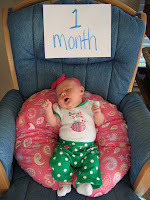 I finally got around to taking and posting Cassies 1 month pictures. I have a friend who took her daughters picture in the same chair every month, and I thought that was a great idea beacuse you can will be able to really see the changes in Cassie as she grows because the chair will stay the same! I can't remember when the picture of Cassie on the pink background was taken, but I thought it was cute, so here it is! I had to bring in the ladder this week to do some of the cleaning that I couldn't reach. 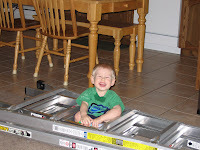 I wasn't able to get to the things I wanted to do while Luke and Cassie were asleep, so the ladder sat in the living room for a few hours waiting for a time when I could get to them. Luke thought that that was the purfect spot to sit and watch his shows. Luke has adjusted really well to Cassie, I may have mentioned that before, so I was able to get another picture of Luke sitting next to Cassie. 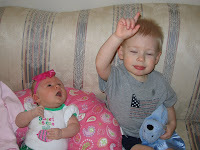 If you are wondering what he is doing with his arm up in the air, he was telling me what an elephant says! Oh! 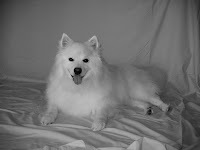 And Cassie satrted smiling this week! 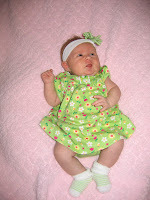 Cassie is now a month old. She weighs 9.5 lbs. Spits up like Luke did... all over the place, and in large amounts. It was really nice the first week having her NOT spit up and I thought that the laundry work load would only increase a little... how wrong I was! I do the kids laundry at least 3 times a week! She is also fussy/colicky in the evening like Luke was. Luke has adjusted well to Cassie. Adjustment to everything else (less time with mama and daddy, being in the house a lot more etc..) has been a bit tricky. He still naps thank goodness, but sometimes it's in the morning, and other times it's in the afternoons. He eats like a bird, I guess on the picky side. Breakfasts/lunches/dinners he will (maybe) eat a few bites of what we give him and then he will throw up his hands and say done. We have tried leaving him in his chair hoping he would eat more, but have found that if we don't take him out and clean up right when he says 'done' that everything ends up on the floor. He still is drinking his milk at meals even though we now no longer are giving him any bottles, and actually ditching the bottles was easier than I thought it was going to be. Luke still goes to bed about 6pm, and even the bed time routine has suffered a bit, but we have been trying to keep that the same. I can feel molars in the back of his mouth, the 2 yr. ones I guess, and we hope that they will come in soon so he will stop eating his hands and drooling all over the place! We find he tries to eat a lot of other things too, shoes, books, Ender's food... really whatever he can put into his mouth, he will! Luke has now learned how to open doors too! When we moved into this house, we found that Ender could open doors because the handles were the lever ones, so we had to go and get the knobs and change all of the doors... well, today we had to go and get knob covers so Luke wouldn't open doors! And he is really into everything else! The other day I found a kitchen drawer in the living room, he had pulled it out of the cabinet, and pushed it all the way in the other room! I don't think it would be that bad, but he seems to do all the things he shouldn't when I can't get to him because I'm feeding or changing Cassie! Someday things won't be this crazy...wait, who am I kidding??? They will just be a different kind of crazy! Well, someday I will be able to get more than 4 hours of sleep in a 24 hour period, someday! -Michael and Ender getting more sleep than me! 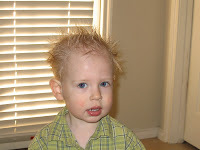 -Luke decided not to hold still anymore after I put gel in his hair to get ready for church...so this was the style that Sunday, pretty wild! 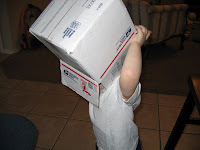 -Luke putting a box over his head. 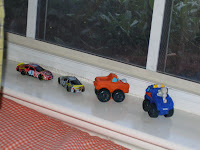 -And this is how we found Luke's cars in the spare room the other day, all in a row! He will do that quite often!